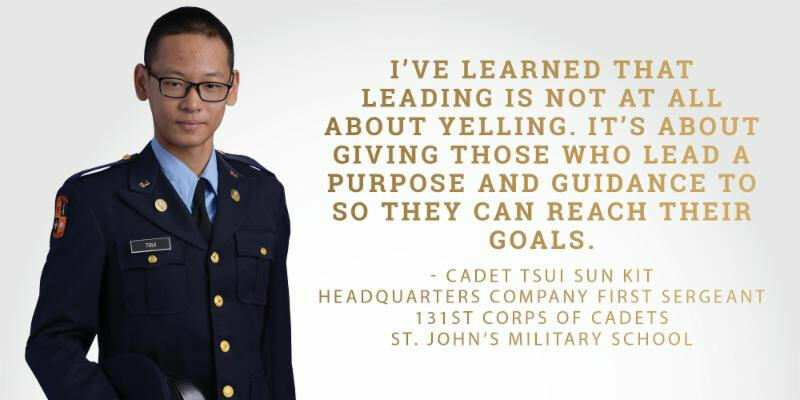 Cadet Tsui Sun Kit did not immediately tell his parents when the leadership at St. John’s Military School selected him to serve as the Company First Sergeant for Headquarters Company for the 131st Corps of Cadets. For Tsui, “home” is far from Salina, Kansas, and St. John’s Military School. He was born in Hong Kong and made the difficult choice to travel halfway around the world to receive a high school education at St. John’s Military School for his freshman year in 2017. The maturity required to realize the value of a structured learning environment is only one of the qualities that make Tsui the ideal fit to serve as a company first sergeant in his sophomore year. He also possesses a direct style of leadership, a desire to hold himself and those around him to the highest standards, and a desire to motivate others to greatness. Tsui will be responsible for assisting the company commander in running HQ Company. According to St. John’s Commandant of Cadet Sergeant Major Ray Nunweiler, the role of company first sergeant requires a regimented mindset and a commitment to improvement. Serving as a drill instructor during his first year, he has already learned vital lessons of leadership and has the maturity and wisdom to understand how to maintain a commanding presence while inspiring those around him to succeed. Developing such a commanding, confident presence was not an easy task for a young man for whom English is not his native language, and for whom America was at first a foreign country. Commandant Sergeant Major Nunweiler has influenced much of Cadet Tsui’s leadership qualities.